Words, words, words. So much of school is words. Directions, instructions, conclusions, questions . . . Sometimes it is lovely to just celebrate word play. 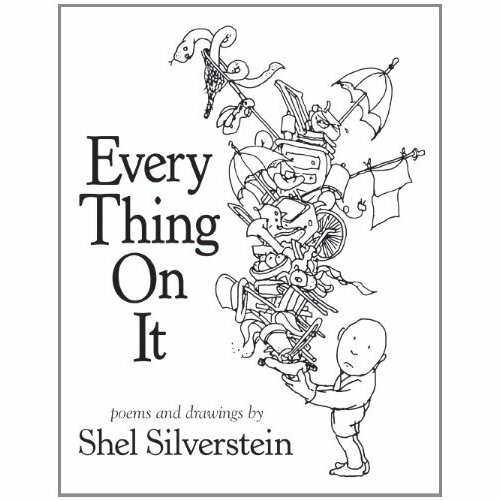 This January we are eeking out small moments to savour the poetry of Shel Silverstein and his poems in the book Every Thing on It. There is simplicity in the complicated and quirky nature of verse. And these poems allow for some small moments of smiles, wonder and reflection. With Silverstein’s words, we can just sit back and absorb. Take a break from our words to enjoy his. Lovely. This entry was posted in Uncategorized and tagged great read alouds, poetry, Shel Silverstein by carriegelson. Bookmark the permalink.